May is one of the busiest months of the year in my garden, and this first week of the month has certainly lived up to that reputation. Every day has been filled with one major project or another. This is my major project for today - canning the last of my carrots from the winter garden. Here, nine pints wait their turn for the pressure cooker. So the fall/winter vegetable garden is finally at an end and I can get on with the spring/summer garden. Maybe sometime this summer I'll actually be able to harvest a tomato. I do at least have some small tomatoes on the plants now. Meantime, all around the yard, the rest of the garden is bursting with life and with blossoms. 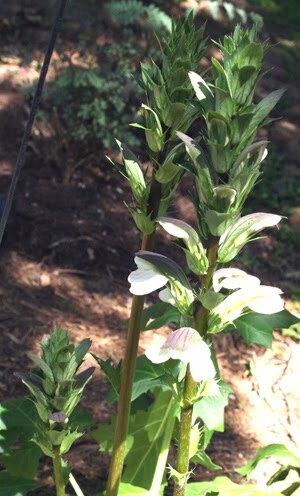 Acanthus mollis, popularly known as "Bear's Breeches," is just beginning its bloom season under the red oak tree. 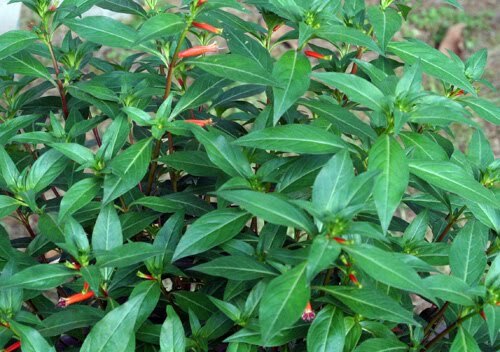 'David Verity' cuphea also is just starting to bloom, but the hummingbirds have already found it. I have two in the yard just now and I've seen them jousting over this plant this week. 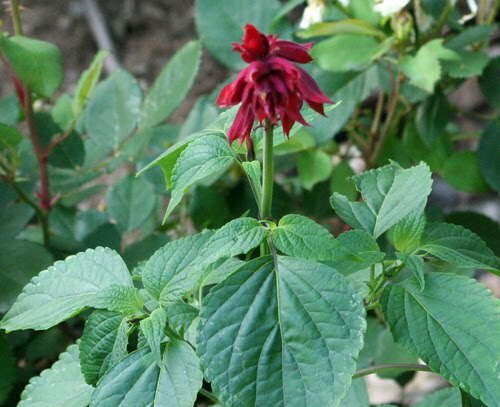 Red porterweed, one of my purchases at the Bulb Mart last fall, survived the winter and is beginning to bloom. The purple one that I purchased at the same time is looking healthy but hasn't put on any blossoms yet. 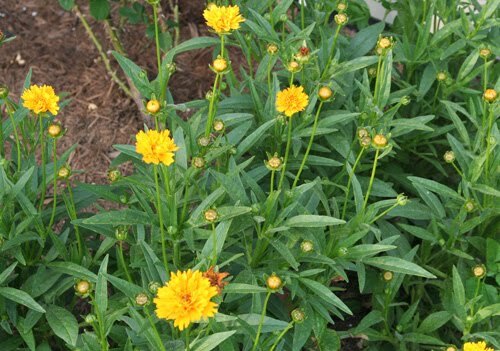 May is daylily month but it is also coreopsis month. This picture was actually taken early in the week. These plants are now covered in blossoms. I've been documenting the growth of my Giant Swallowtail caterpillars. This picture, too, was taken earlier in the week and you can see that he was beginning to deserve the name "Giant". 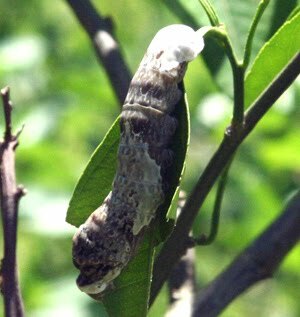 When I checked the Satsuma a couple of days ago, both of the caterpillars were gone - off pupating somewhere, I presume - and I'm sure the Satsuma was relieved to see them go! It lost a good number of leaves to their voracious appetites. 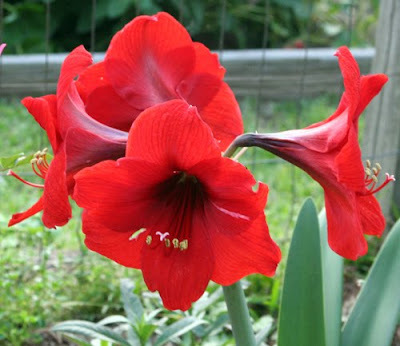 'Red lion' is a very common amaryllis but no less beautiful for being common. 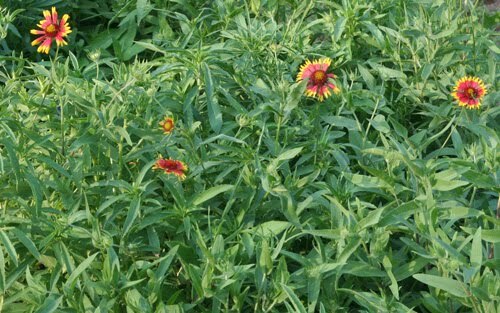 Though the bluebonnets are still blooming in the wildflower bed, they are now screened from view by the gaillardia, which is just coming into its own. The avian population of the yard is "blooming," too. 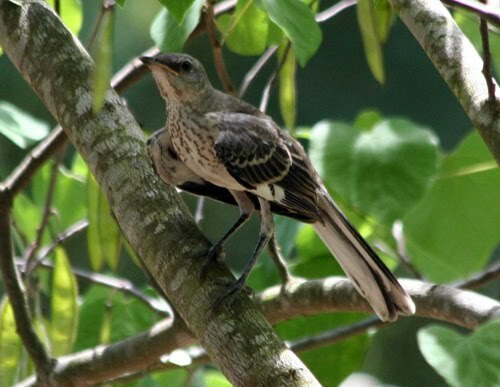 This is one of the young mockingbirds. Though he's as big as his parents, he still has the speckled breast that marks him as a baby and he still follows Papa around the yard begging to be fed. 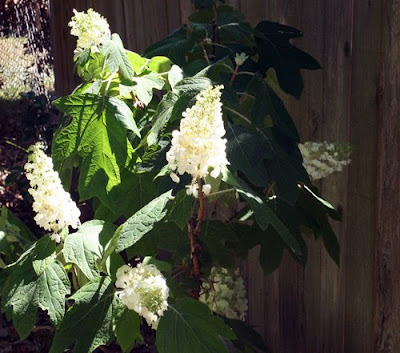 The oakleaf hydrangea is almost in full bloom, while the nearby lacecaps are just beginning their bloom. I have Orchard Orioles in my yard. I haven't seen any Baltimores yet, but they may be around as well. 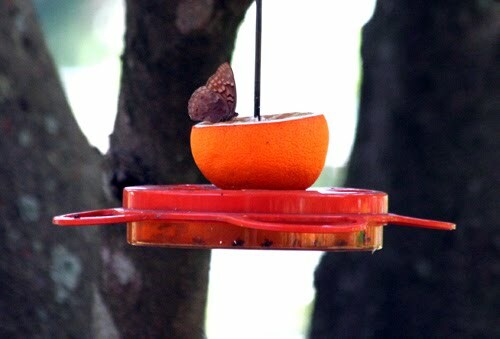 Backyard birders tell me that orioles are EASILY attracted to feeders that have nectar, oranges and/or grape jelly. I've tried attracting them in the past without success but I decided to try again. Hmmm...that's a strange looking oriole! Here's a closer look. Still doesn't look much like an oriole, does it? Well, I'm just glad something is benefiting from the feeder. Speaking of butterflies, the various swallowtails have been hovering around the fennel. 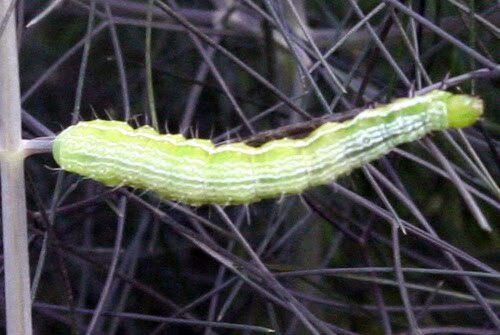 I was checking the bronze fennel for caterpillars and didn't find any swallowtails, but this guy did turn up. I think he's the larva of one of the Sulphurs, but I'm not sure which one. 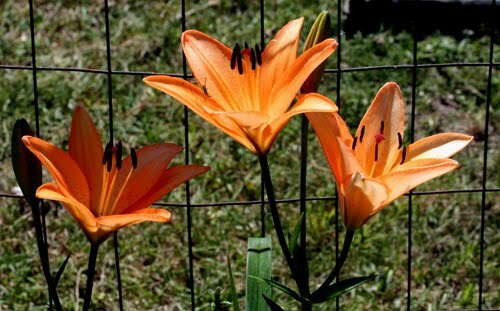 This is also the season of the hybrid Asiatic lilies. 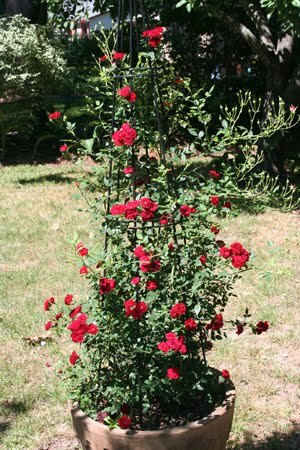 It's classified as a mini, but the only thing mini about the 'Red Cascade' rose is its tiny quarter-sized blooms. 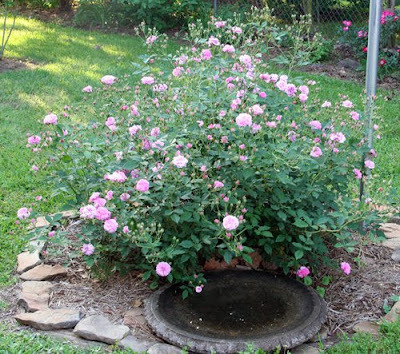 The plant itself can grow 10-15 feet tall - or even taller. 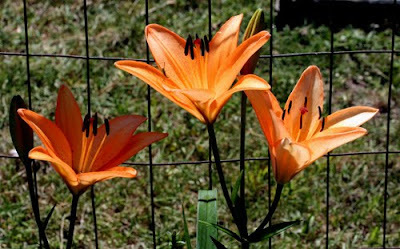 The polyantha, 'Caldwell Pink', seen here in a hedge next to the veggie garden gate, also has the quarter-sized blooms and lots of them. 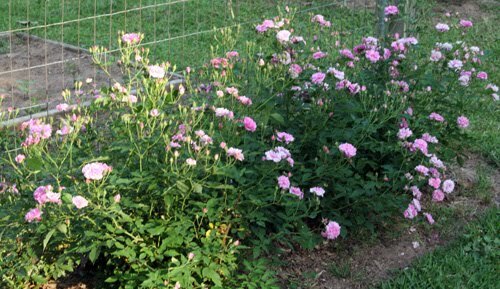 This is the mother of all my other 'Caldwell Pinks', the one that lives in the side yard and is visible from the kitchen window. When it is in full bloom it is completely covered in its tiny pink blossoms and it looks like one big rose. That's how things look in my garden this week, but more changes are coming. I made a run to the Antique Rose Emporium in the middle of the week which means that there are more plants to be planted. 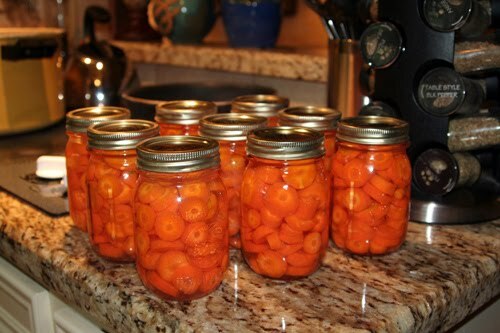 Just as soon as I finish canning carrots. Hi Birdwoman - How funny that I was googling the 'Red Cascade' rose that followed me home from Barton Springs Nursery and ended up at your blog! I already was planning on visiting to see if you made it to the ARE. My Red Lion & Oakleaf hydrangea are blooming now too but no daylilies yet. I hope the Orioles come to your garden! I think you'll like the 'Red Cascade', Annie. It's certainly a favorite of mine. 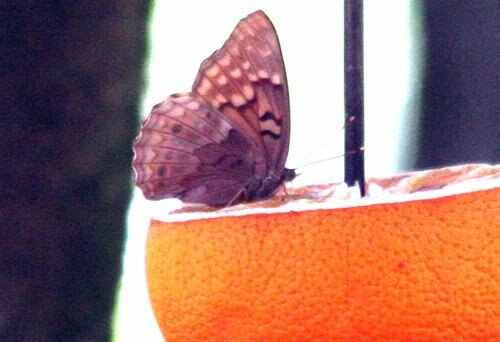 Butterflies and hummingbirds love my oriole feeder, but so far no oriole - to my knowledge - has taken a sip. Oh, well, at least somebody is using it!